Thierry Henry has been named Footballer of the Year for a record third time by the Football Writers' Association. 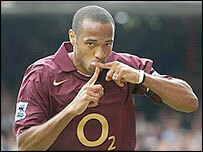 Henry, 28, is the first player in 59 years of the FWA award to receive the accolade three times. This season Henry has broken the club's all-time goalscoring record and led Arsenal to their first European Cup final against Barcelona in Paris. The striker won the FWA award in 2003 and 2004, with last year's honour going to Frank Lampard of Chelsea. The Arsenal captain will receive his latest award at the FWA dinner at the Royal Lancaster Hotel, in London, on Thursday 11 May. Chelsea's John Terry came second, Manchester United's Wayne Rooney third and Liverpool's Steven Gerrard fourth in the votes cast by the country's football writers. Sir Stanley Matthews, Kenny Dalglish, John Barnes and Gary Lineker all won the FWA award twice. FWA chairman Paul Hetherington said: "Henry is a deserving winner in a season when there have been several outstanding candidates, such as Terry, Rooney and Gerrard. "Henry's achievement ranks him up there as the greatest player in the 59-year history of the award." Gerrard was named the players' Player of the Year and collected his award on Sunday.